This is not some kind of radical right-wing group. I just hope the Congress, the Senate and the president recognize that people are afraid of what’s going on. Uh huh. That really means a lot coming from a guy like DeMint. 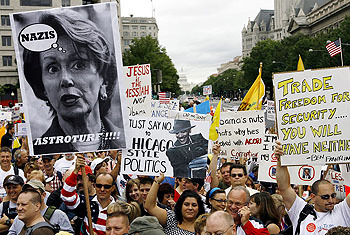 But what I’m really curious about is the guy in this photo with the Nancy Pelosi sign. I’m trying to figure it out. The other signs all sport some pretty standard fare (Chicago thugs, socialism, Acorn, cap-and-tax, etc. etc. ), but what’s this guy trying to say about Pelosi? That she dreams of Nazis? That she thinks about Nazis? That she’s secretly a Nazi? And then there’s the even more puzzling “ASTROTURF!!! !” business. Is Nancy Pelosi an astroturf Nazi? What would an astroturf Nazi be? Or is he suggesting that conservatives can defeat Pelosi via an astroturf campaign? Somebody help me out on this.